System dynamics is an interdisciplinary problem-solving methodology that utilizes several significant thinking skills such as dynamic thinking and cause-and-effect thinking. System dynamics is a disciplined collaborative approach that could accelerate learning by combining a multifaceted perspective that provides insight into complex and interactive issues. System dynamics is designed to model, analyze, and improve socio-economic and administrative systems using a feedback perspective. Dynamic structured administrative problems are modeled by mathematical equations and using computer software. Dynamic constructions of model variables are obtained using computer simulations. 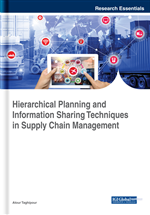 In this chapter, a system dynamics model will be developed for supply chain management. The case study will be developed using VENSIM package program. The concept of supply chain management is relatively new. It was first articulated in a white paper produced by a consultancy firm-then called Booz, Allen and Hamilton- back in 1982. The focus of supply chain management is on co-operation and trust and the recognition that, properly managed, the ‘whole can be greater than the sum of its parts’(Christopher, 2016). The management of upstream and downstream relationships with suppliers and customers in order to deliver superior customer value at less cost to the supply chain as a whole. A network of connected and interdependent organizations mutually and co-operatively working together to control, manage and improve the flow of materials and information from suppliers to end users. There is a basic pattern to the practice of supply chain management. Each supply chain has its own unique set of market demands and operating challenges and yet the issues remain essentially the same in every case. Companies in any supply chain must make decisions individually and collectively regarding their actions in five areas: Production, inventory, location, transportation and information (Hugos, 2018).